Classes are held individually throughout the year (from October to July), usually onceor twice a week for 45minutes (The number and length of classes can also be arranged individually). In the summer, workshops dubbed the »intensive package« are organised, comprising a sequence of 10 successive classes. When studying at the Ljubljana Pedagogics Academy Department of Mathematics and Physics, where she graduated in 1983, Žagar also studied solo singing taught by Prof. Jelka Stergar at the Ljubljana Secondary Music School, won the award for best Slovenian young musician and graduated in 1985. She worked for a year as a math teacher at an elementary school in Ljubljana, before getting a job at the Ljubljana Opera Theatre, where she successfully played several minor solo roles. In 1988, she joined Mira Omerzel and Matija Terlep, Trutamora Slovenica Ensemble , in presenting Slovenian folk musical heritage through concert performances. Singing folk songs was a challenge, given that folk songs should by definition sound natural, as opposed to »artificial«. The search for the natural sound quality in a voice has changed the course of her career. In order to be able to pursue it, she left aside the opera singing and sought employment as an opera promptness, while simultaneously starting to teach natural singing. Using the rain stick helps us to relax. 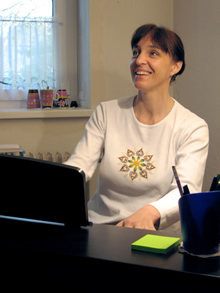 She has been teaching natural singing since 1990, including seven years as an independent co-worker at the Franc Šturm Music School in Ljubljana. In 2005—2008, she offered regular weekly vocal exercises to the actors of the Ljubljana City Theatre. Since 2004, she holds the status of a self-employed cultural worker. Her path of spiritual seeking began with the Maharishi Transcendental Meditation (TM) in 1990. She has, however, found her most valuable tool for the evolution of consciousness in guided sound and movement - VEDUNA Cosmic Resonance - and in the teachings of Veduna School - Slavic-Pythagorean School for the Development of Consciousness and Harmonisaion with Sound - led by PhD Mira Omerzel - Mirit. Besides being a member of the VEDUN Ensemble - Ensemble for Ancient Meditative Music and for the Revival of Spiritual Healing Ethno Sounds of the World – Mojka Žagar was also active as a sound-energy therapist. The basis for her pedagogical work is the knowledge of voice nurturing she gained during her schooling and later constant cooperation with Prof. Jelka Stergar. Professor Stergar was the first one who has brought the natural and relaxed (unstrained) vocal technique in the Slovenian space. 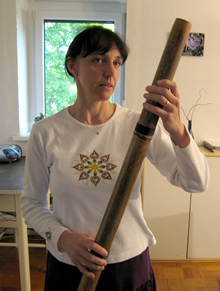 Her work is influenced by the discoveries of musical pedagogues that were also motivated by perceiving singing (or instrument playing) as a natural process (the seminar of Prof. Kurt Widmer /Basel/: »Voice and Movement«; prof. Amy Likar /California/: »Body Mapping«/ »What Every Musician Should Know about Their Body«) and involves her own knowledge of spiritual-therapeutic treatment she has gained from Veduna School, collaborating with PhD. Mira Omerzel — Mirit, trough her own researching and self experience.